It’s tiresome driving anywhere in the UK these days. Planning a journey can be a combination of trying to avoid interminable queued traffic, bone-jarring potholes and suspension-stressing speed humps. Whilst satellite navigation systems can be set to “avoid motorways” and are beginning to have some rudimentary knowledge of traffic jams, albeit generally too late, they wont be particularly useful until they can avoid these other tiresome features, too. Yesterday we took a morning spin down to Canon’s service centre in Borehamwood. Having dropped off my lens for repair, on the way back we decided to call in at Whipsnade zoo for the first time in ages to get a bite of lunch and to see how some of our friends were doing; there were a few new “zoo babies” that we wanted to check out. Not having my security stool with me, it was also serve as an experimental wander to see how my leaking might be getting on. 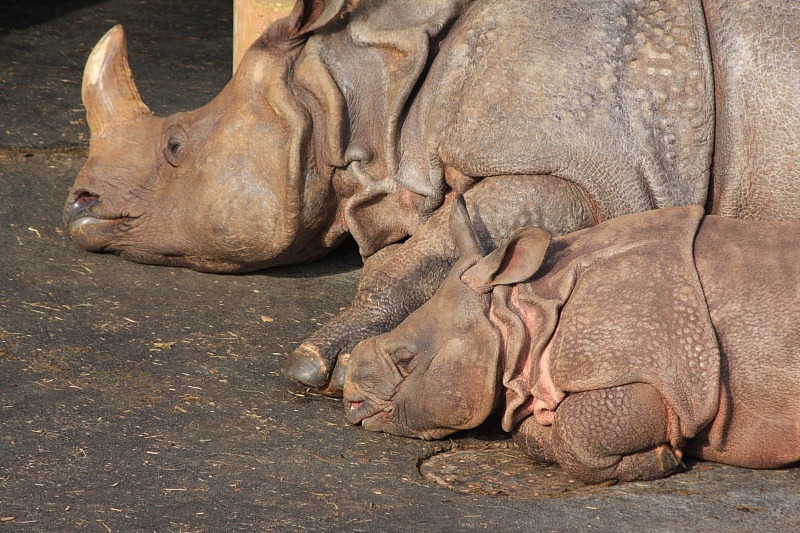 Whipsnade has managed to breed its Greater One-horned Rhinos (Rhinoceros unicornis, or Greater One-horned Tanks, as we like to refer to them). These characters are absolutely huge and their skin really does look like armour-plating. 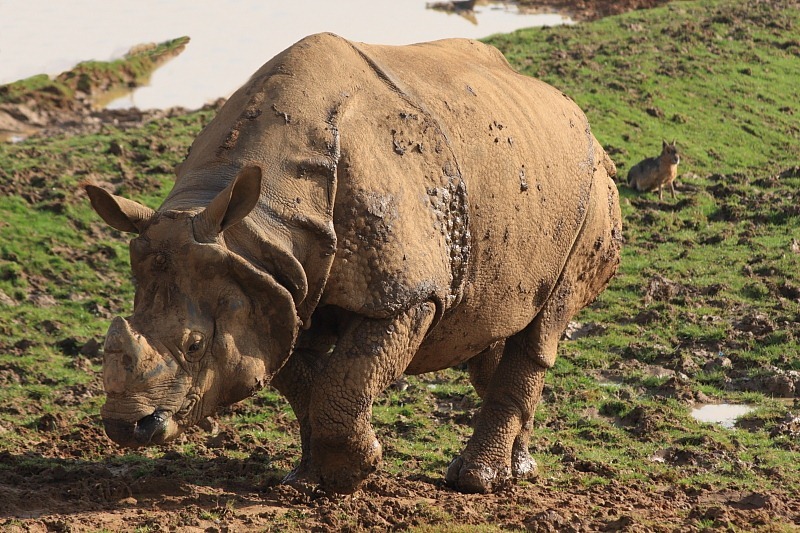 On the left is a fully grown specimen – the male, I think – wandering about in its very muddy paddock. The Patagonian Mara sitting behind it is a bit of a giveaway that this is not shot in its natural habitat. The Mara seems unconcerned but I certainly wouldn’t want to get in the way of this fella. On the right are a mother and youngster, cute in a knock-you-down-and-trample-you-to-death kind of way, soaking up a little of the welcome February sunshine. Another point of interest, and definitely scoring higher on the cute-ometer, was a family of Cheetahs. The proud mother is on the left lying atop her manufactured den containing, in blissful repose, four of her five fluffy cubs. Irresistible! The fifth cub was actually up on top of the den with mum. Whipsnade has a “drive through Asia” section where pedestrian traffic is not allowed. 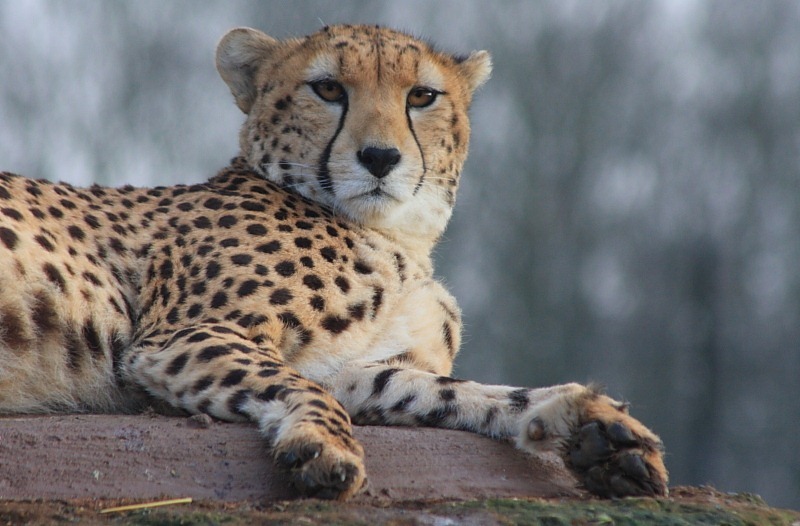 During the worst of the winter, Whipsnade’s car park is closed and visitors may take their car into the zoo free of charge. Since we are usually on foot for our visits, this time of year is about the only time we have our car to hand enabling us to actually do the drive through Asia. Yesterday was no exception. We were making good progress passing the herds of Asian deer in the main section but ground to a halt towards the exit when our progress was interrupted for several minutes by Whipsnade’s newest traffic calming measure – a set of speed humps towards the exit. "Speed humps in a zoo?”, I hear you ask in a surprised voice. Yes, here they are on the left together with a similarly impeded fellow visitor. 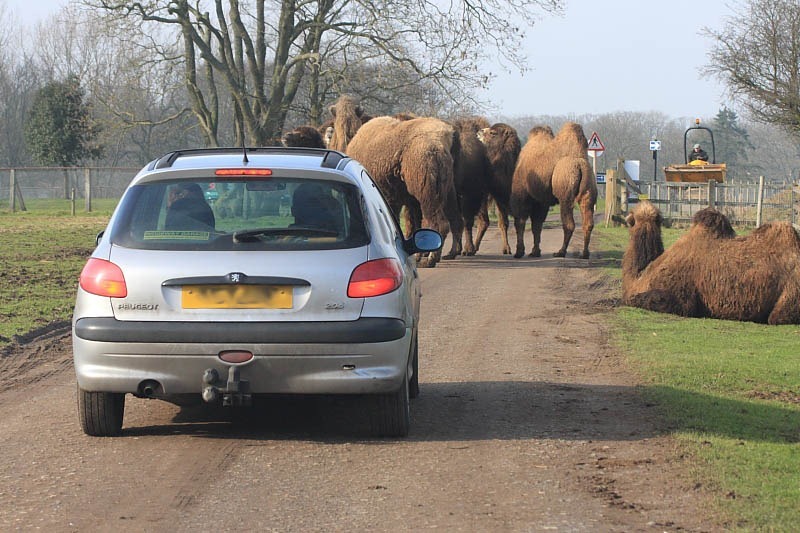 In addition to the herds of Asian deer, this section is home to Yaks and Bactrian (two-humped) camels, some of which had decided that the road way by the exit was exactly the right place for them to stand and/or lie down soaking up some of that all-too-rare February sunshine. 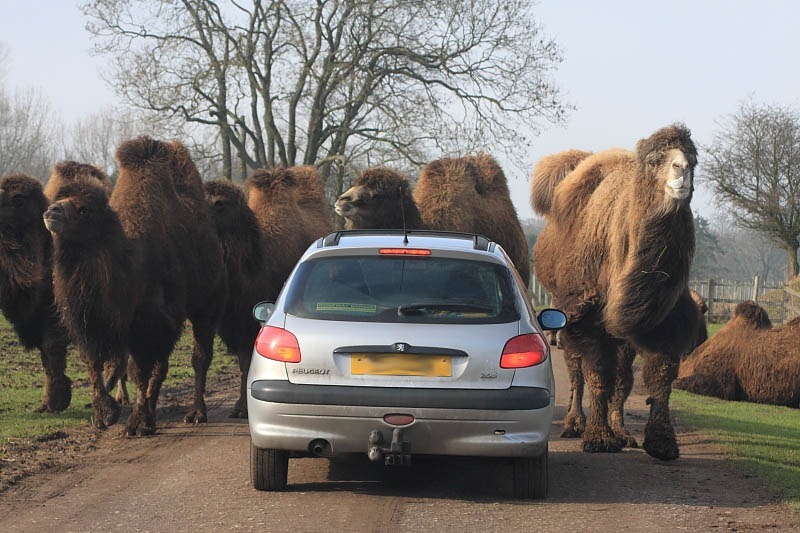 Our fellow visitor in the lead vehicle tried revving the balls off his engine in an attempt to persuade the hirsute roadblocks to move on but all to no avail; the camels remained unconcernedly in place. Eventually a man driving a dumper truck turned up and got the camels moving whereupon they moved rather closer to the cars than was conducive to complete comfort. Whilst I hadn’t felt particularly “secure” leakage-wise, on occasion, it wasn’t too bad so it may help me redouble my efforts at pelvic floor exercises.